12 by 12 ½ by 13 ½ in. 30.5 by 31.5 by 34 cm. 10 ½ by 23 by 12 in. 26.5 by 58 by 31 cm. 11 by 16 7/8 by 8 1/8 in. 27.9 by 42.9 by 20.6 cm. 5 1/2 by 12 3/4 by 13 in. 14 by 32.4 by 33 cm. 9 by 8 3/4 by 10 1/4 in. 22.9 by 22.2 by 26 cm. 12 by 11 1/2 by 5 in. 30.5 by 29.2 by 12.7 cm. 9 1/2 by 11 by 10 in. 24.1 by 27.9 by 25.4 cm. 9 5/8 by 17 7/8 by 18 3/8 in. 24.4 by 45.4 by 46.7 cm. 9 by 20 1/4 by 14 1/8 in. 22.9 by 51.4 by 35.9 cm. 11 3/4 by 27 3/4 by 26 3/4 in. 29.8 by 70.5 by 67.9 cm. Mitchell-Innes & Nash is pleased to announce an exhibition in the Uptown gallery of new small sculptures in bronze by Sir Anthony Caro. This series of ten works, made in 2011, relates to the artist’s recent landmark project for the Chapel of Light in the Eglise Saint-Jean-Baptiste, Bourbourg, France. This will be the gallery’s fifth solo exhibition of Caro’s work. To create works in this exhibition, Caro cast a group of maquettes for the Chapel in bronze, then expanded on these with rolled industrial bronze and brass as well as used shell casings to create new forms. Caro continues his interest in the relationship between interior and exterior space with forms that fold in on themselves and draw the viewer’s eye around the work. 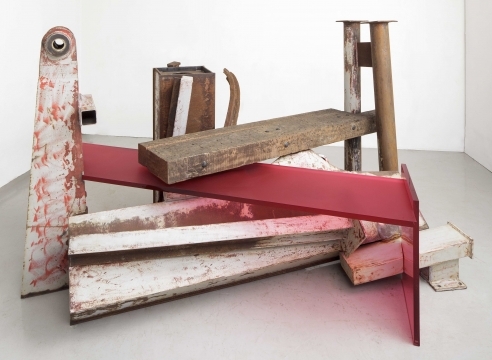 Anthony Caro is considered to be the most influential British sculptor of his generation. His recent solo exhibition, Anthony Caro on the Roof, was on view at the Metropolitan Museum of Art, New York in summer 2011. His work is represented in over 150 museum collections. Major exhibitions of his work have included retrospectives at the Museum of Modern Art, New York (1975), the Trajan Markets, Rome (1992), Museum of Contemporary Art, Tokyo (1995), and Tate Britain, London (marking his 80th birthday in 2005). Over a five-decade career, he has received numerous honors including a Knighthood in 1987, the Order of Merit (OM) from the Queen in 2000 and a lifetime achievement award from the International Sculpture Center in 1997. Caro was born in 1924. After receiving a master’s degree in engineering from Cambridge University, he studied sculpture at the Royal Academy schools in London and worked as assistant to Henry Moore.